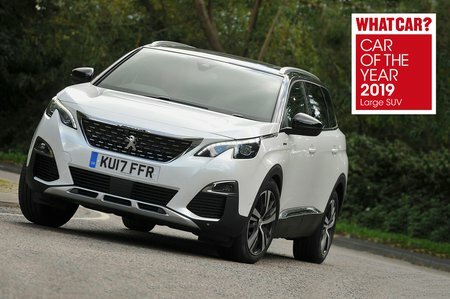 Peugeot 5008 2.0 BlueHDi 180 GT 5dr EAT8 2019 Review | What Car? What Car? will save you at least £2,472, but our approved dealers could save you even more. The 5008 is stylish, practical and good to drive. It's also relatively affordable to run, especially if you go for the peppy, but still efficient and frugal, 1.2 Puretech 130 petrol. If you're not bothered about seven seats and fancy something a little better equipped then the Mazda CX-5 is well worth considering, but otherwise, for our money the 5008 is one of the best seven-seat SUVs you can buy. The top-spec model throws in an electrically operated driver’s seat with four-way lumbar support, memory recall and massage facility. You also get nappa leather seat trim, 19in alloy wheels, adaptive cruise control, a powered tailgate with gesture control and keyless entry and start. However, we don’t recommend this trim for two reasons: it’s quite pricey and you get a standard panoramic sunroof. While a sunroof might sound like a good thing, it severely limits rear head room. This 175bhp engine is flexible and has no trouble dealing with hefty loads. With the power and shove it has driving just the front wheels (you cannot get four-wheel drive with the 5008) it can scrabble for grip when accelerating hard from a standstill but, once moving, feels pretty brisk for such a big family wagon. Comes as standard with an eight-speed automatic gearbox.